The RODECaster Pro is a revolutionary all-in-one studio console that brings a new level of simplicity and professionalism to podcast production. No other console contains all these features. This is incredible technology and simplicity in one package. The RODECaster Pro is the only true answer to this question: How do I create a professional sounding podcast, easily? Here's a closer look at the features. The RODECaster Pro's pristine mic preamps and outputs feature Class-A circuitry, as found on the world's best broadcast consoles. The Class-A preamps provide a much cleaner gain structure with lower levels of distortion, providing an incredibly clean, low-noise signal. The Preamps are also servo biased, keeping distortion levels low and your signal broadcast-pure. That pristine signal can then be shaped with Aphex audio processing. The legendary APHEX Big Bottom and Aural Exciter processors, as found in the world's top broadcast studios, are included in the RODECaster Pro - giving your voice the presence and depth you deserve. You can even add APHEX magic to the music or speech audio from your Bluetooth, USB or TRRS connections. APHEX Big Bottom and Aural Exciter - instant professional tone, depth and warmth. De-esser, to lessen sibilance on 's' words. The RODECaster Pro comes equipped with 4 high-powered headphone outputs using discrete circuitry for clarity and presence, each with its own volume level. A switchable headphone limiter ensures no deafening spikes. Left and right TRS speaker outputs provide quality playback listening, or can feed a PA for an audience if podcasting live. The RODECaster Pro operates as a standalone unit out of the box, recording direct to microSD card - so you can be up and running in minutes. 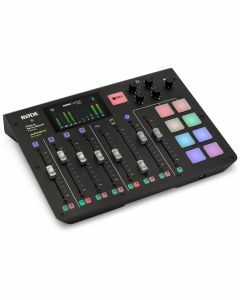 You can also connect the RODECaster Pro to your computer via USB, as the RÃ˜DECaster Pro is a class-compliant USB audio interface. This means you can also record your podcast to your favourite DAW or recording software.